INSTANT ENERGY, INSTANT LAUGHTER, INSTANT PHOTOS! The energy is beyond belief. Select Entertainment Photo Booth simply electrifies any event. If you’re like all the other clients we’ve worked with, you want your guests to have the time of their life. Even more you want them to remember your event as the best they’ve ever attended. Our Photo Booth makes the difference. Nobody stays in their seats. I’ll make you a bet: I bet the photos your guests take home from your Photo Booth end up in scrap books, photo albums, and even on refrigerators. Your event will be the one everyone remembers. Our Photo Booths create instant memories, laughter and fun. Your guests will immerse themselves in creative, memorable fun. We will make your events successful because they create interactive fun that is recorded on the spot forever. Your guests will go home with some of the best candid photos they’ve ever seen of themselves. Plus, you get to take home a scrapbook full of wonderful memories. Our inflatable photo booths can easily hold 8 people at one time. On the outside of the booth, it has LED lights that slowly change colors throughout the night. 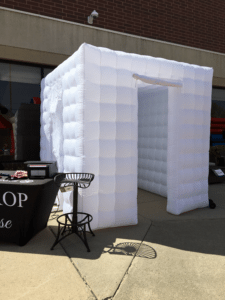 We also have a smaller photo booth pop up tent that can hold up to 6 people in it for those locations where space and ceiling height are a concern.